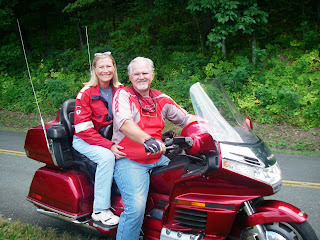 We left the Cookie Lady on Sunday with our thanks and rode from Afton to Charlottesville on a rolling Hwy. 250. Once in town we called Bob from the University of Virginia and he came to pick us up. After a wonderful dinner with Bob and Donna, we had a great conversation late into the wee hours, solving most of the world's problems. Thanks to the wonderful hospitality of Bob and Donna, we have stayed over a day to see Monticello. 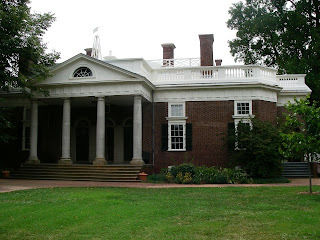 Thomas Jefferson was truly a great thinker and that fact is reflected in the home he built. We have four days of riding to reach Williamsburg where we will headquarter for sightseeing and an unloaded daytrip on the bikes the last 13 miles to Yorktown. Yes we can almost smell that sea air now! 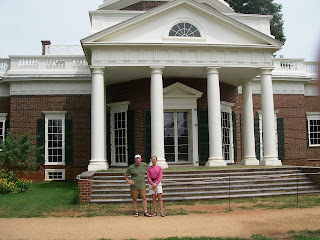 Dave and Belinda, I am so glad you were able to visit Monticello! Sounds like you guys have had great touring in Virginia. Your ride from Charlottesville east should be easy sailing! Hi Anne, We have had great touring in Virginia, thanks to friends like you and Bill, and Bob and Donna. I think you are right about easy sailing as far as terrain is concerned but it looks like we may have rain for the next week..
Whoa, you're almost done! Soon, no doubt, you'll be ramping back up onto the Crossfit plateau. Good luck. I just got back from lots of hiking and kayaking around Lake Tahoe, so I missed a few days of your postings. Great pictures and text, as usual. One thing I DID notice was a mention of the "official transamerica route" and wondered where you joined it? In Utah or Colorado? Have you been following some official version for the whole trip? Hey Mark, glad to hear from you. Yeah, we have less than 150 miles now.. and I understand there's a Crossfit gym in Yorktown! Sounds like you've been having a good time. We have been following two Adventure Cycling routes (in a general way) for the entire trip. First we were on the Western Express route which goes between San Francisco and Pueblo,CO where it joins the Trans-Am route (which starts in Astoria,OR.) We deviate whenever it makes sense.